“We wanted three points, we got one. Maybe we dropped two. But it was a difficult game, Villa made it difficult. They stopped us from playing when we had the ball, they played a long-ball game and closed us down. Our passing was not as fluent as usual but we had very good chances. We don’t usually miss the chances we missed tonight. 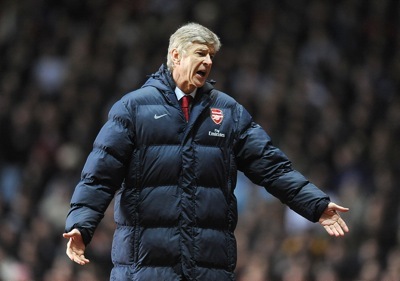 Appalling is over the top, but I understand why MoN would find Wenger’s comments patronising, not to mention untrue. From what I’ve seen of Villa under O’Neill, they can pass it around both short and long. And anyway, there is a big difference between a hoofed clearance upfield or an aimless punt in the direction of Kevin Davies (say) – those are long balls – and a measured long pass; Villa play long passes when it suits them, often to initiate rapid counter attacks. I didn’t see Ashley Young play many long balls as he spent most of the match destroying Gael Clichy’s reputation – a point O’Neill also made. I guess Wenger was pissed off at a) the perceived dropped points, and b) the injuries suffered by Thomas Vermaelen and Eduardo. Still, no need to go after O’Neill – he’s one of the good guys. Stat attack! Villa have now gone four league games without scoring. Villa have NEVER gone five Prem games in a row without scoring. Their next league match is at Fulham. bore off. such a load of tosh. o’neil has got a problem with wenger and Arsenal. he tried to disguise it pre-game with all his lovey dovey comments, but the slightest thing which is actually a compliment has made him go nuts! yes they play a basic method of football that has worked for over hundred years. nothing patronising. we at Arsenal like to make things more complicated than necessary on the pitch sometimes. football is a simple game, and o’neils villa keep it simple. defenders defend, midfielders work hard, get the ball wide and cross it to a striker. o’neil is obviously slightly racist and xenophobic with his “in his time here” remark. pathetic non-story blown out of all proportion. o’neil should not read the papers methinks. Rather poor that you’re running this complete non-story. And Villa DO play long balls – particularly behind the full backs for Agbonlahor to run onto. 90% of Wenger’s comments were complimentary about Villa, but of course that doesn’t make headlines. For the record, Arsenal completed 350 passes in the game, while Villa made only around 280. To be fair Julian, completing fewer passes than Arsenal in a game is hardly shameful. As you say, they were playing the ball in behind to use Agbonlahor’s pace, rather than lumping it forward aimlessly, which the phrase “a long ball game” implies (as Wenger knows well). Also, I don’t think you can really accuse O’Neill of racism for saying “in his time here”, it’s political correctness gone mad etc.